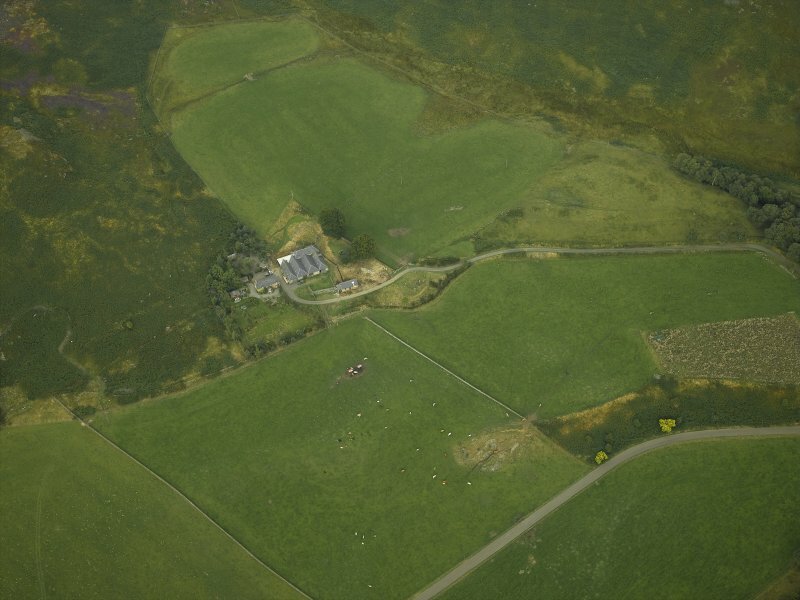 General oblique aerial view of Colmeallie centred on the remains of the stone circle, taken from the SSW. 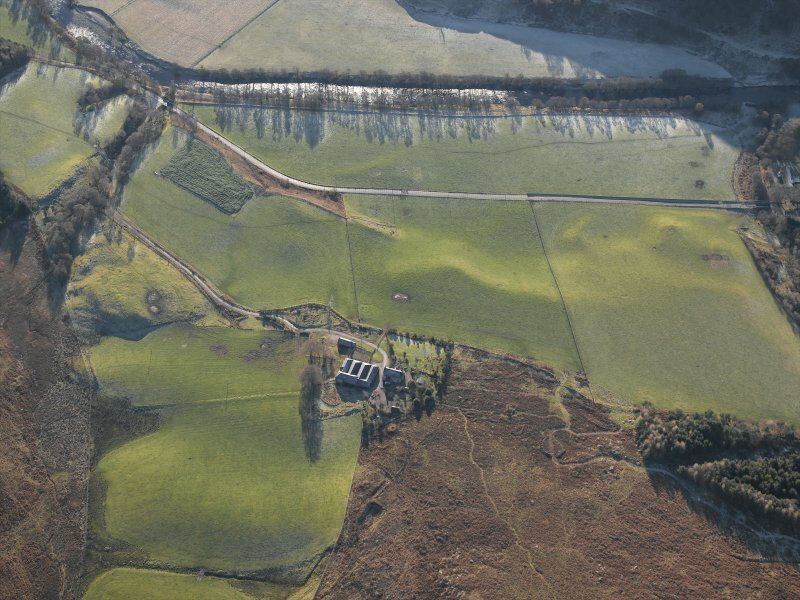 General oblique aerial view of Colmeallie centred on the remains of the stone circle, taken from the NNE. 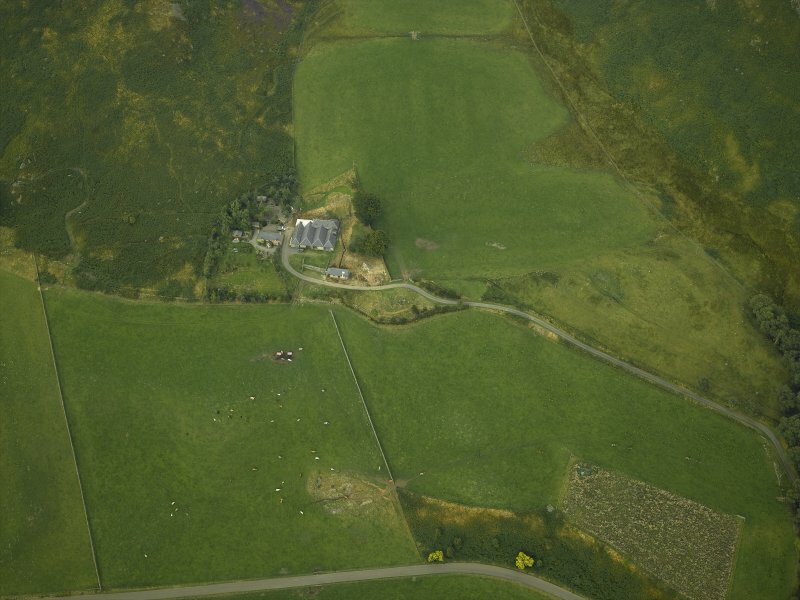 Oblique aerial view centred on the remains of the stone circle and the farmhouse and farmsteading, taken from the SSW. 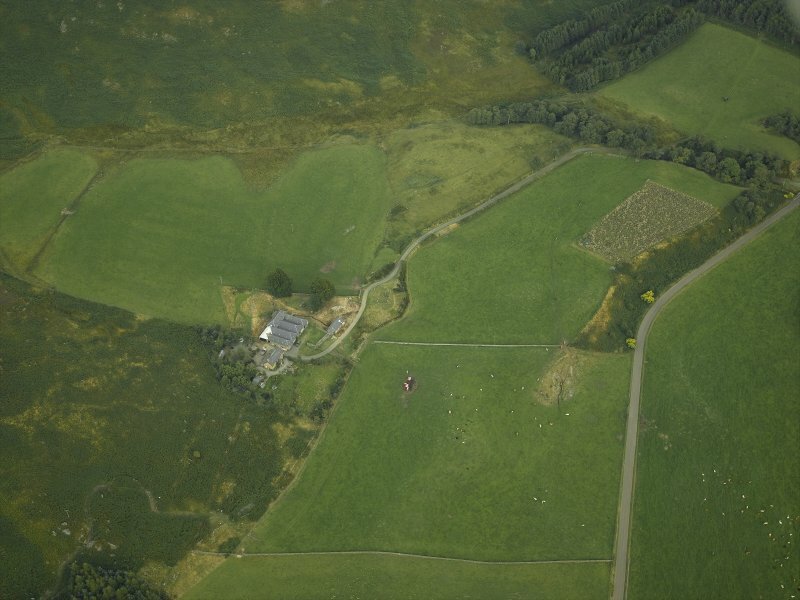 Oblique aerial view centred on the remains of the stone circle and the farmhouse and farmsteading, taken from the SW.
Oblique aerial view centred on the remains of the stone circle and the farmhouse and farmsteading, taken from the W.
Survey photographs: Film 3 of site visits to various recumbent stone circles. Includes Colmeallie. 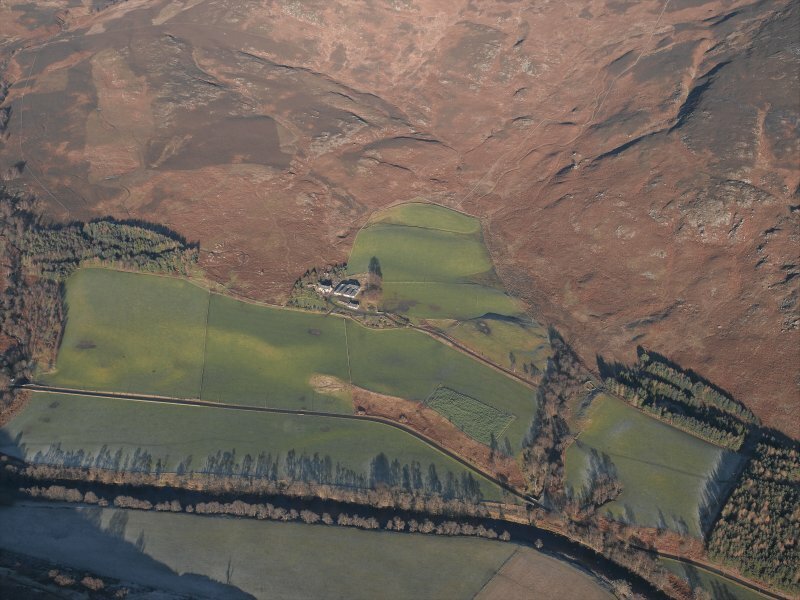 General oblique aerial view of Glen Esk centred on Colmeallie, the remains of the stone circle, farmstead and enclosures, taken from the SE. 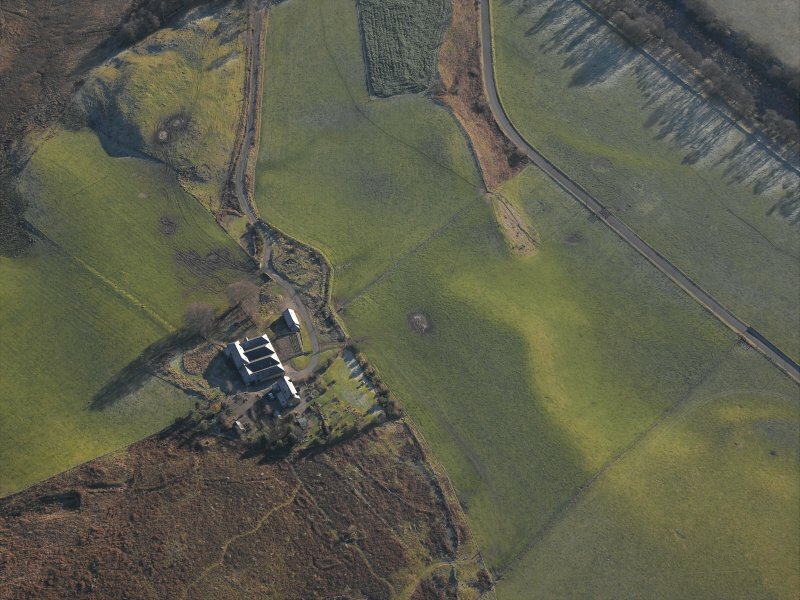 Oblique aerial view centred on the remains of the stone circle with the remains of the township adjacent, taken from the ESE. 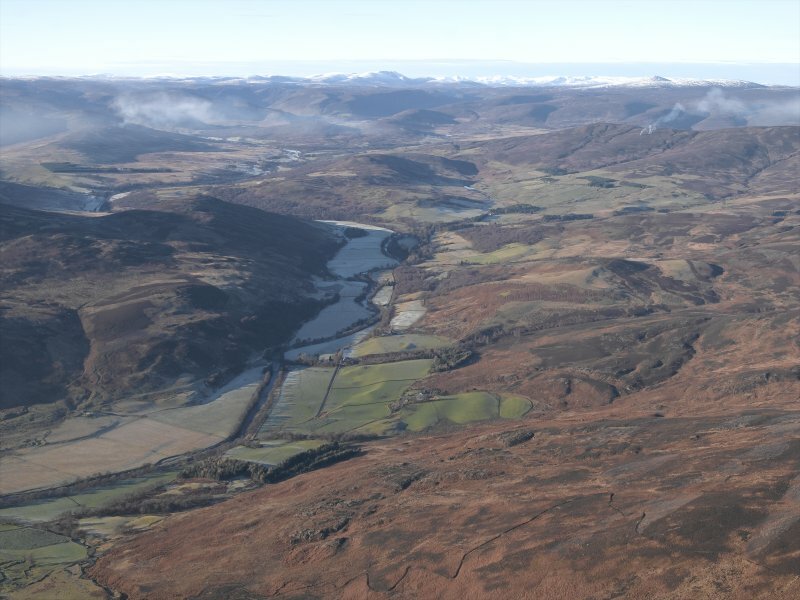 General oblique aerial view looking across Colmeallie and the remains of the stone circle along Glen Esk towards the Grampian mountains, taken from the WSW. 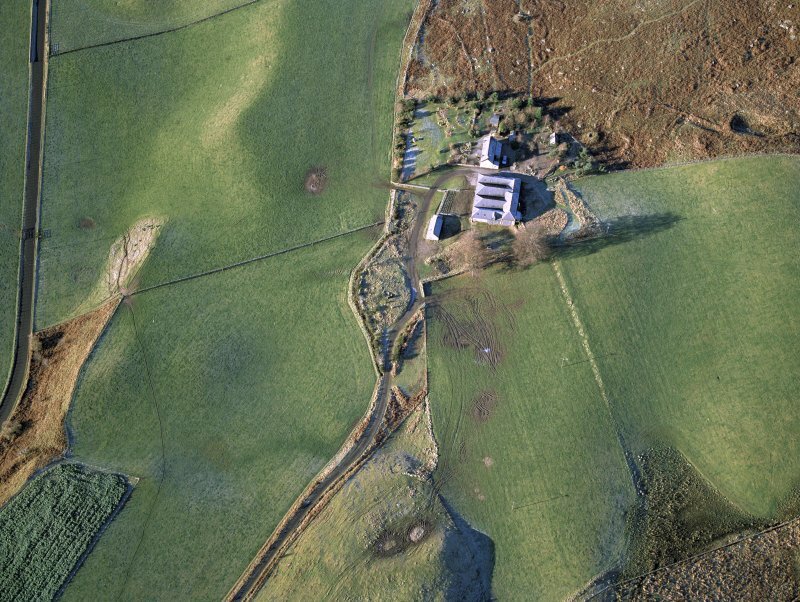 General oblique aerial view of Colmeallie centred on the remains of the stone circle, taken from the NW. Two concentric circles consisting of from 15-20 stones with only 3 stones erect, the highest being about 5'4" [1.6m]. The largest lies prostrate, 9'5" [2.9m] long by 7'5" [2.3m] broad. Other stones from the circles are built into the adjoining dyke, and one large one forms the centre support of a cart-shed. A Jervise 1882; A J Warden 1880-5. The remains of a stone circle with most of its stones displaced, truncated in the N by a road, and seems to be little changed since 1882. 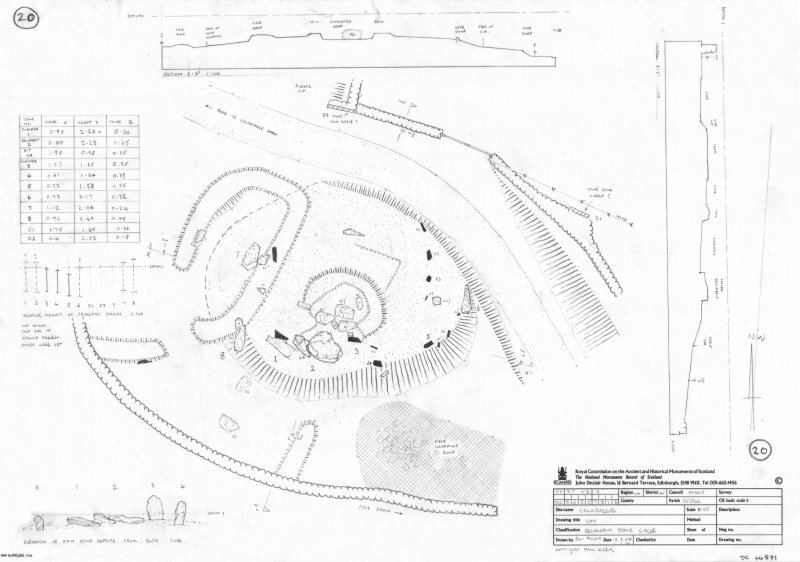 It has been placed on a turf-covered mound, measuring about 15.5m in diameter and 0.6m high. Only three stones (A, B and C) of the outer circle are in situ, giving a probable overall diameter of 14.5m. Four small stones of the inner circle survive in the E about 2.0m inside the outer circle, and another (D) 2.1m tall in the S which, although perfectly erect, may not be in situ. To the W of this stone are three recumbent stones, one (E) measuring 3.0m x 2.2m x 0.5m. The shape and size of 'E' and its position on the SSW arc of the circle suggests a tentative identification as a recumbent stone circle. However, this classification can only be upheld if 'D' has been erected at a later date and this cannot be possitively determined. Visited by OS ( J L D) 28 July 1958 and (A A) 12 August 1972. Information from Historic Scotland, scheduling document dated 29 November 2005. 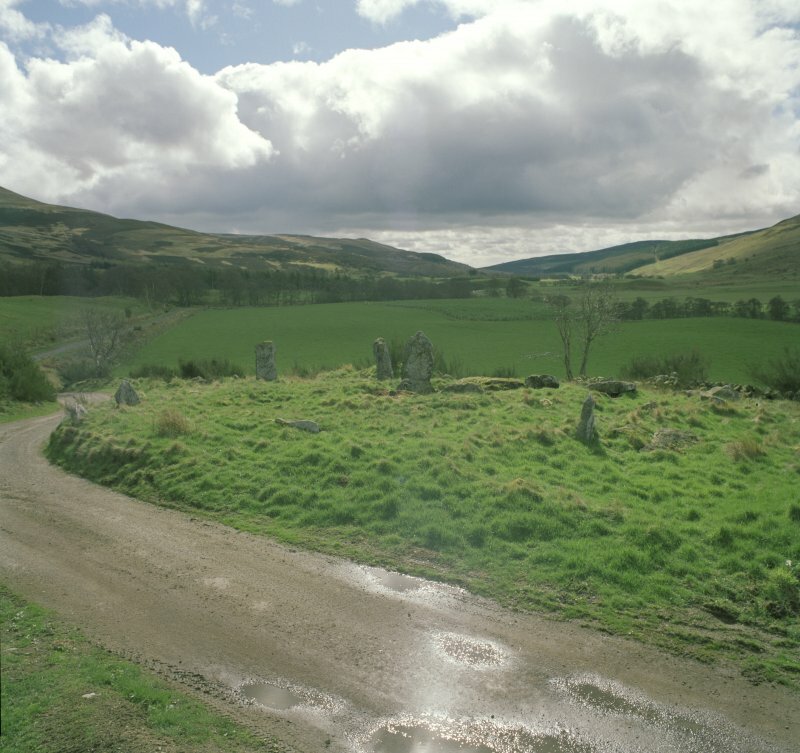 This stone circle is situated immediately SE of Colmeallie steading (NO57NE 23). 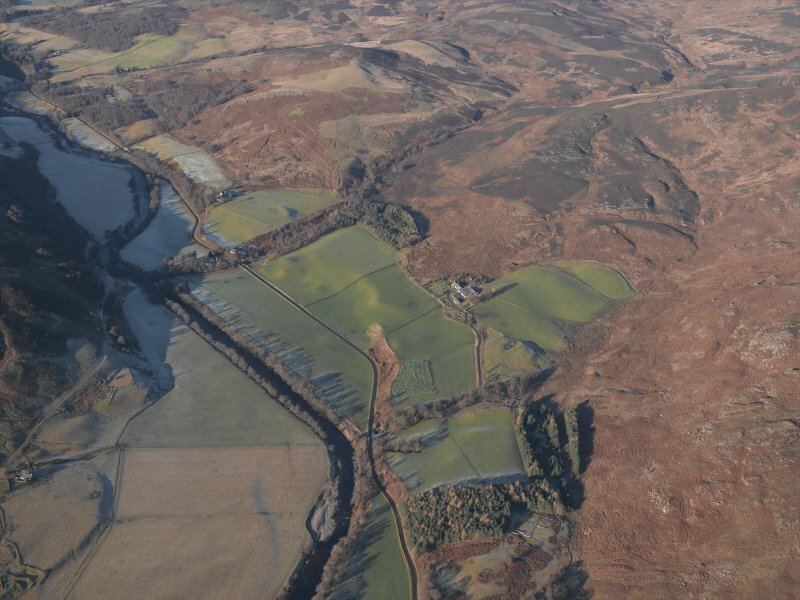 Information from RCAHMS (RJCM), 10 February 2006. 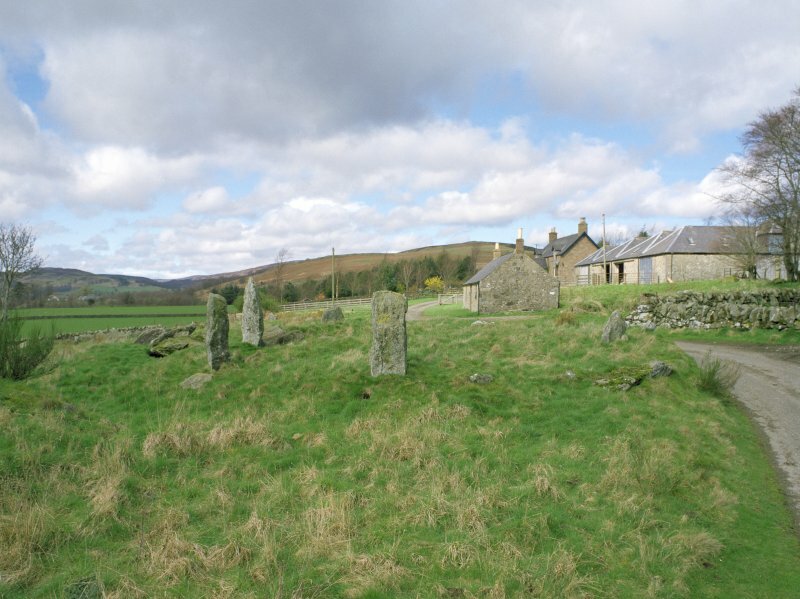 This recumbent stone circle is situated on the N side of the valley of the North Esk, standing on the leading edge of a knoll to the S of the farm road up to Colmeallie. It has been heavily damaged and only five orthostats remain upright, one of them being the E flanker (3), but the broken recumbent (2 & 2a) and at least four other large stones (5–7) lie on the skirts of a stony mound that extends well beyond the projected circumference of the circle; two more slabs probably from the circle are built into dykes on the N and ENE respectively (D & C), and others are known to have been reused elsewhere (below). 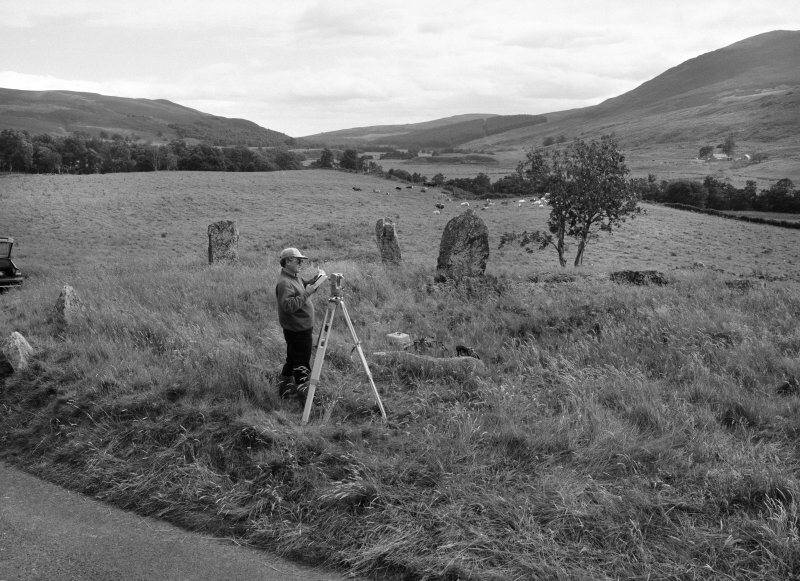 Despite the damage, the disposition of the surviving stones suggests that it was probably a composite monument comprising two roughly concentric rings of orthostats, the outer measuring about 17m in overall diameter and the inner 11.5m. The surviving E flanker (3) shows that the recumbent setting formed part of the inner circle, which was probably set out along the kerb of a central cairn, though it is now impossible to distinguish the cairn material within the line of the kerb from the rest of the surrounding mound. In this position, the recumbent setting stood well within the projected circumference of the outer circle, probably fronted by a shallow forecourt with its mouth framed by two orthostats, the eastern of which is upright (B) and the western fallen (A). The W flanker (1) of the setting is missing, but the recumbent (2) lies where it has fallen on its face and is broken into two unequal pieces; the larger piece measures up to 2.8m in length by 2.25m transversely and its SSW edge preserves the gently domed shape of the summit. The E flanker (3), which is no more than 1.65m high and thus probably shorter than the recumbent, faces due S rather than SSE, apparently tracing the arc of the inner circle, of which as many as three orthostats are still in place, one being a stone 1m high on the WSW (6a) and the other two 0.8m (4a) and 0.4m (5a) high respectively on the ENE; in contrast to the two surviving kerbstones of the central cairn, which protrude no more than 0.25m above the cairn material, each of these stone rises to a pointed top, and comparison of their heights indicates that the inner circle was graded to reduce in height northwards from the flankers. The outer circle has been reduced to six stones, two of which are those at the mouth of the forecourt (A & B). As at Aquhorthies (No. 2), these stones may be additions to the design and it is noticeable that the foot of the eastern (B) is set askew any circumference projected by the axis of its neighbour (4). Furthermore, a single kerbstone that can be seen behind this upright is set at an angle that suggests the line of a heavily flattened façade springing from orthostat 4 on the ESE, rather than the edge of the forecourt; another three kerbstones roughly extend the arc northwards to the fallen stone on the E (5). Such an arrangement is strongly reminiscent of The Nine Stanes (No. 49); there the recumbent setting also stands back on the edge of the internal cairn, but without any evidence of a forecourt. 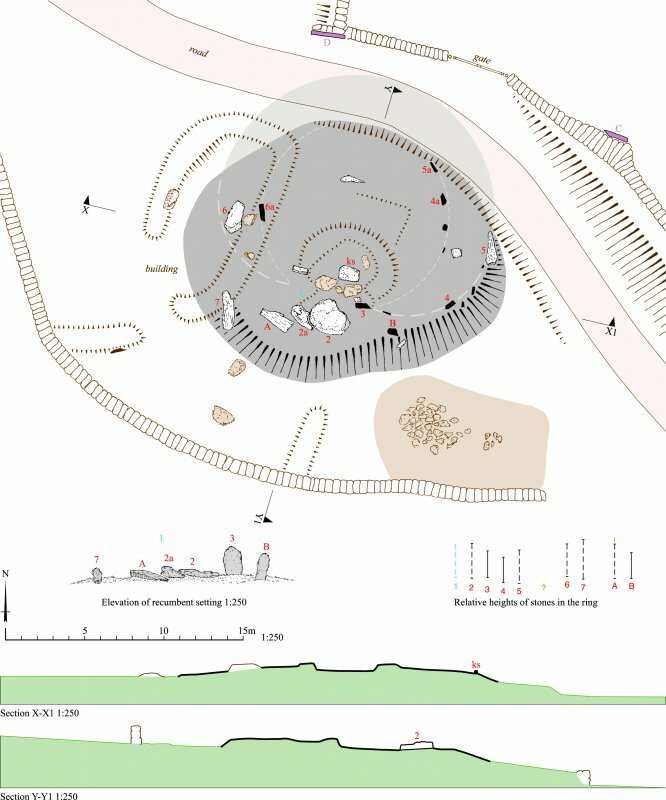 The cairn at Colmeallie has been heavily disturbed, not least by a large pit about 4m across sunk behind the recumbent, but the reduction of the body of the whole mound to its present low profile, now measuring 20.5m from ESE to WNW by 16.6m transversely and 0.5m in height, is of some antiquity and evidently predates the construction of the overlying building on the W; orthostat 6 now lies within the interior of this building and was presumably only moved into its present position after the building was abandoned.